Last December, Qualcomm said Windows 10 would soon arrive on the ARM architecture, and it's had its first demo. The news hit at MS Build, with software architect Arun Kishan and Lead Program Manager in the Window Core Kernel Platform Group Hari Pulapaka showing the capability off in this video. It's an x86 emulation layer between Windows 10 and the Qualcomm Snapdragon 835 processor underneath (chosen for its battery life, Pulapaka says, giving Microsoft its ready-made pitch – “The Anywhere, Anytime PC”). It's a full desktop experience which, ironically noted by Liliputing, is less locked-down than Windows 10 S, because the Win 10 on ARM can run non-Windows Store applications. Stuff that's native to the ARM device – for example the camera, USB ports and the like – get pulled into Windows 10 without change. 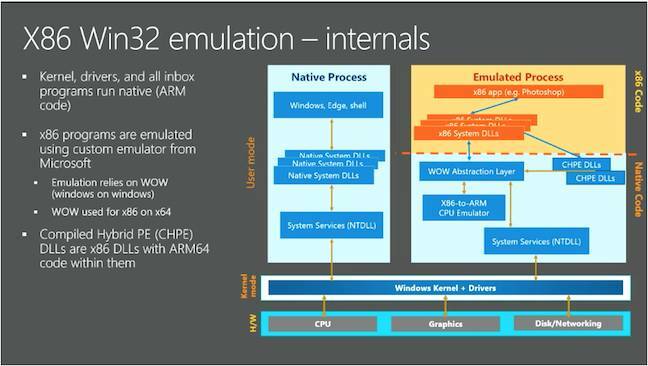 Emulated apps use a Windows-on-Windows abstraction layer, talking to the x86-to-ARM CPU emulator; below that, there's a system library (NTDLL) that handles the system calls to a kernel layer between the OS and the hardware. Kishan explained that rather than try to run some kind of dynamic emulation, Microsoft developed a “Compiled Hybrid PE” (CHPE) – a set of x86 DLLs with x86 data types, and ARM64 code. “These are like perfectly pre-generated binaries”, he added. To prove that the emulation works, Kishan downloaded the venerable 7zip to run in Windows 10 on ARM.